Michael. 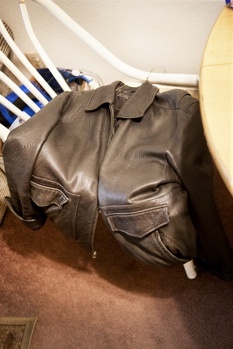 Large Black Leather Jacket. $10. Hollywood. Photo by Brigitte Sire. Article first published as Book Review: It Chooses You, by Miranda July, with photographs by Brigitte Sire on Blogcritics. The hardback edition of Miranda July’s It Chooses You is the size and heft of a Hardy Boys or Nancy Drew adventure. There are no murders or eerie old houses in this non-fiction endeavor, but it is an adventure — an adventure of human contact. July was struggling with the screenplay for her second feature film, The Future, and found herself too easily distracted by the internet. She laments that her writing career had managed a meagre output before cyber ubiquity settled into its now permanent state of flashing cleavage and kittens in front of anybody trying to get work done on a laptop. But were there any distractions left untouched by the virtual? The author found reality in the form of junk mail. Among the sales flyers delivered to her door was the print edition of the Los Angeles Penny Saver. The modest ads selling trivial items inspired what became a meaningful distraction. July called up prospective subjects to ask if they’d sit for an interview. It’s an invasive and potentially condescending adventure, but participants received fifty bucks, and what July got in return was a terrific, moving book that is better than the sum of its parts. It Chooses You selects thirteen subjects who answered the call, to tell their own story and in some way help shape July’s fiction with their true stories. The kinds of items offered for sale are trivial: a $10 leather jacket; a $5 hair dryer dating from the first Bush administration; a $2.50 bullfrog tadpole. But the people selling these wares have fascinating stories to tell, all the more so when the author finds a rapport with them. It Chooses You is a compelling hybrid of photobook, memoir and social observation. The photos were made by July’s wedding photographer, Brigitte Sire. There is an awkwardness to some of the portraits — the transactions, such as they were, were not always the most comfortable. But the subjects with whom July and her small crew warmed up to made for the warmest and most touching photos. Curious details of the sellerss home and wares are also pictured. I’l lleave it to the reader to discover the fascination of a series of hand-labelled manila envelopes. Although the book has a naturally episodic nature, a kind of narrative develops as July ponders the class divide between her and her subjects, her own neuroses about the creative process, and the small miracle of human beings connecting with each other at all. Most of the people July interviewed, for reasons of class or age or culture, did not own a computer. Such people are not long for this world, and represent the crossroads of an era. Much like the dawn of the industrial age that hangs over masterpieces like À la Recherche du Temps Perdu and The Magnificent Ambersons, the author modestly but surely documents an elegy for a dying world.